Squirrels are wild animals and this affects what they should eat in captivity. 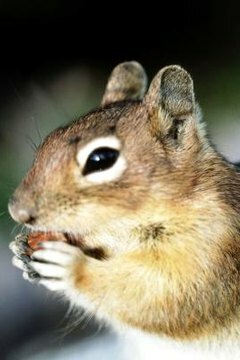 Squirrels can subsist on pre-made food designed for rodents, but they should also get fresh foods to round out their diet. It's also important to make sure your pet is getting the right balance of nutrients essential to squirrel health. Squirrels in the wild are foragers and opportunistic daytime feeders. Because you'll be providing all your squirrel's food, she won't expend as much energy looking for sustenance, so her feedings should be controlled to avoid excessive weight gain. You can give your squirrel one to two rodent blocks per day, and feed fresh foods once or twice a day as snacks. Rodent blocks are premade food designed for animals like hamsters, rats, guinea pigs, mice and squirrels. They include foods your squirrel needs every day and are already balanced for good nutrition. Rodent blocks can be the primary food source for your squirrel, making up 75 percent of her diet. However, some squirrels won't eat rodent blocks unless they're introduced to them from a very young age or are the only food source available. Fresh foods should make up 25 percent of your squirrel's diet. Low carbohydrate vegetables, low sugar fruits, nuts, seeds, edible flowers and eggs are all good choices for squirrels. Foods native to your area are especially recommended for wild born squirrels. Tree nuts like walnuts, pecans, almonds and hazelnuts are full of nutrition that will benefit your squirrel. Seeds like sesame seeds or pumpkin seeds are also beneficial to your pet. Make sure that any produce, flowers or plants you bring from outside to feed your squirrel are thoroughly cleaned and free of pesticides. Calcium is one of the most important nutrients for your pet squirrel. Chew bones such as cuttlebones sold in pet stores for birds, or animal bones for dogs can provide calcium for your squirrel. Animal grade bonemeal powder and eggshell powder are also good calcium sources that you can mix into your squirrel's food. You can make your own eggshell powder by boiling, drying, and grinding eggshells in a clean coffee or spice grinder. Just 1/2 teaspoon a day packs plenty of calcium. Your squirrel also needs vitamin D to help her body synthesize calcium. Even 30 minutes a day in the sun will provide enough vitamin D, but if this isn't an option, she'll need a vitamin D supplement in her diet. Experts in wild squirrel care advise not to feed avocadoes, cashews, corn, dried fruit or vegetables, figs, garlic, onions, palm hearts, pine nuts, persimmons, plums, potatoes, prunes, raisins, sprouts, sunflower seeds and sweet potatoes. Seed mixes should not make up the majority of your squirrel's diet because they're too high in fat. Any form of processed human food, like pasta, bread, cookies, pretzels or breakfast cereal contain ingredients not suitable for squirrels, as do any foods with added salt or sugar. Squirrels shouldn't eat beans, including kidney beans, lentils, soybeans and so on, but green beans and sugar snap peas are okay. As is true for all pets, artificial sweeteners are not safe for squirrels.